This release includes a few usability improvements and fixes related to the editors and a new tool for applying updates in bulk to your voxel models. Most notably are the improvements to the editor tabs within the Map Editor, Voxel Editor, Script Editor, and Dialogue Editor. Each tab now has a close button (white “X” icon”) that can be used to close that tab. This replaces the red “X” close button on the toolbar. The tabs will now also display an asterisk in front of the resource name when there are any unsaved changes. If you attempt to close a tab with unsaved changes (or exit the application with any unsaved tabs), a confirmation dialog will appear to confirm the action before proceeding. Also, if there are too many tabs to display in the available space, left and right arrow buttons will now appear that can be used to scroll through all of the tabs. 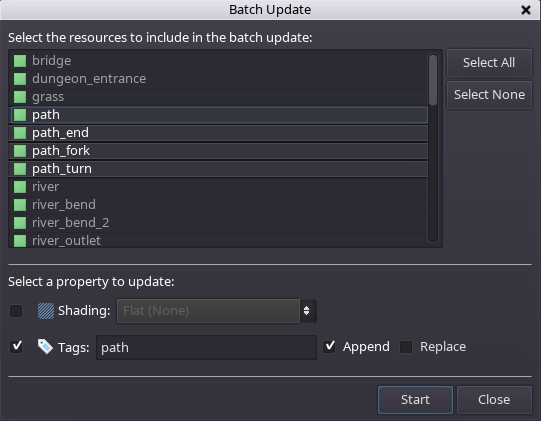 The new “Batch Update” tool included in this release will allow you to make updates to certain voxel model properties in bulk. The button for this tool is located at the upper right corner of the application. You can select one or more resources to include and the property you wish to update. Currently, you can either modify the shading effect for the selected models or the tags. When selecting to update the tags, you have the option of either appending the tags (which keeps any existing tags for the models and just adds the specified tag(s)) or replacing the tags. Please note that if you use this tool to update the shading for a large number of resources it may take a few minutes since the textures have to be generated again for each model. A progress dialog will display to indicate the individual and overall progress. I have also started working on the improved Script Editor that is planned for v0.3-alpha. I still have a ways to go, but here is a sneak peek of what it will look like! 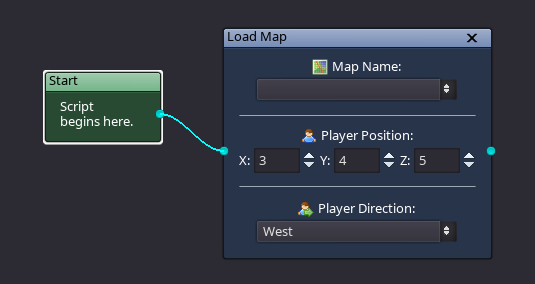 The style will be similar to the Dialogue Editor and will allow you to drag-and-drop nodes and edit the function parameters within each node as shown below.